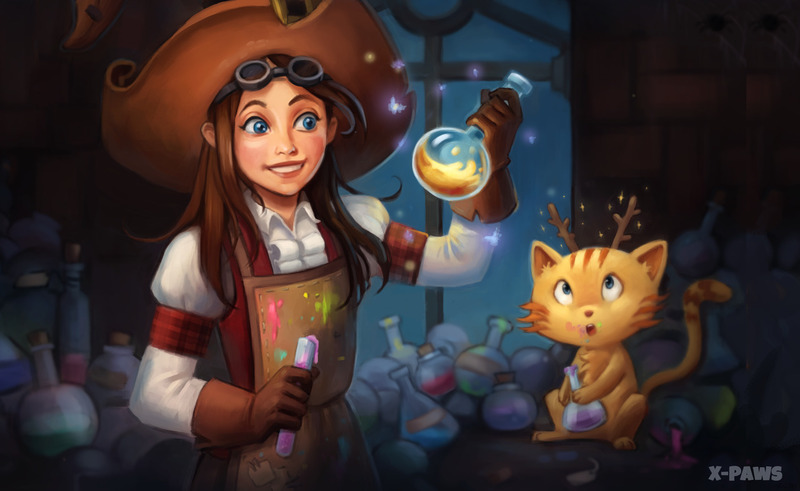 Artwork: "The curious incident with potions"
The video-game team X-paws is currently working on a demo for a Pepper&Carrot video game. The demo will invite the player through a few levels with platforms, broom racing, brewing unique potions and throwing potion at opponents. The team is planning to develop a system to let the player brew over 100 million potion recipes for almost limitless possibilities. Target platforms: Android, iOS, Steam. Currently, the game is still in early development stage and new team members are welcome to grow the X-paws team: artists, Unity/C# dev, etc... It's a no-budget demo project with plan to share incomes after the game starts doing profit. The core of X-paws was funded by core contributors and translators of Pepper&Carrot, so I'm trusting this team and their project to keep the mood of the universe and I'm sure they work on it with passion. I'll keep updating this blog-post to follow important milestone of the Hereva Adventure project. but, its just me, different people have different tastes, and fannart is an medium that accept off model, its not like it where canon. This is just an art for the post. He does not give any information on the game itself. Each artist has his own drawing style. This is difficult to adapt to someone else's style. In addition, drawing for the game and drawing art are also different things. The team is small, and a small number of people have to work out a large amount of work to be done by people in their spare time. The team is working hard on the project in which it believes. Fan and concept artwork is what it is - just another interpretation. We've got some of them, and they still differ from both comic and in-game style. Why make it all the same or try to copycat David's amazing work if we can try taking other routes and see where they take us? Why would they make a proprietary game? SO disappointing. We would be happy to create games on a free license, but creating games requires a lot of resources, that's why we do it. We want to make the game quality and interesting. We do not want this game to be the last one. Start a CrowdSupply campaign to make this 100% FOSS. We'll fund it no problem. Proprietary software is a major letdown. Alternative could be make it FOSS, but also sell it on officials like Play market etc. Like ownCloud does, or OSMAnd. Many people are still lazy enough to buy it instead of compile it themselves. You see, so far licensing is still a matter to discuss: what we know for sure is that we're going to create a game that is entertaining and fun to play, set in already familliar Hereva universe, and has as high quality as possible - and yet we expect to get some reward for it (as for, obviously, any other kind of work), that's why for now it's just "proprietary". It's not about just making money on a title, and since we can't dedicate all of our time to development at the moment, it's not even close to be fair to ask community for funding. Fisrt major goal is to release a demo: it'll be free for everyone to make their opinion on whether it's worthy or not. Only then it'll become clearer in means of licensing and further development.